my lid with a plum coloured pencil from p2 (Intensive Khol Eyliner 080 Magic Thailand). 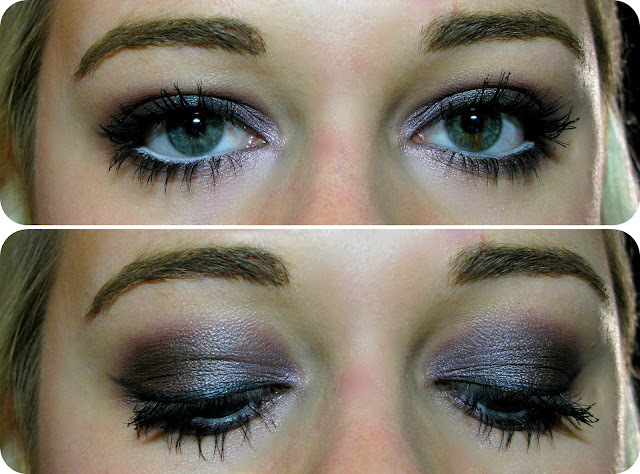 Then I used Tendersmoke from MAC all over my lid and blended it out. After that I used MAC's Seedy Pearl in the inner corners of my eyes. In picture five, the eyeshadow I used for the outer corners and outer half of my lid was MAC's famous eyeshadow Satin Taupe. Next I used Carbon from MAC and an angled eyeliner brush to create a soft black line. After that I used a light pink pencil from p2 to brighten my waterline and the last step is curling my lashes and using mascara (I used Benefit They're Real and Lancôme's Doll Eyes Mascara). To finish off I used MAC's Blush in Mocha and MAC's Lipstick in Hot Gossip. By the way, I'm sorry that the eye make up looks a bit washed out, in real life it's shimmery and not as subtle as it looks, but it's still not an overwhelming look.